Death Stranding gameplay stuns Metal Gear Solid movie director: "How does this miracle exist?" 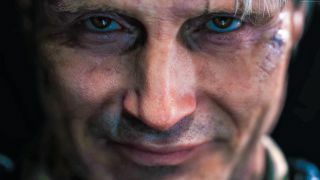 Metal Gear Solid movie director previews Death Stranding, calls it "next-level immaculate"
Norman Reedus has already offered his thoughts on Hideo Kojima's upcoming PS4 epic Death Stranding, of which he is the central star, but The Walking Dead season 9 actor isn't the only one building up the hype for the auteur's first game since Metal Gear Solid 5. Jordan Vogt-Roberts, outspoken director of Kong: Skull Island and The Kings of Summer, is a notable video game fan, and currently attached to the Metal Gear Solid movie project (with the explicit blessing of Hideo Kojima) that's been gestating at Columbia Pictures in one form or another for decades. The idea of ingesting the narcotic equivalent of Hideo Kojima and famed Metal Gear Solid artist Yoji Shinkawa is certainly one way to describe the act of playing a video game, and fits the bill for what we've seen so far from Death Stranding, one of the strangest experiences this side of the console generation. Kojima has also showed off his new baby to both Guerrilla Games and Remedy Entertainment in recent months, which suggests Death Stranding is now in a playable state, though we still have no release date attached to the title as of yet. Still Vogt-Roberts' latest comments are high praise indeed, and only amplify our expectations for what could be a literal game changer. Death Stranding will (fingers crossed) be one of several new games of 2019 that we'll get to play this year. Check out which others are worth looking out for!